There are many things that go bump in the night, and more that put up an awful clamor. It would be interesting to put a microphone outside, pipe it to a computer, and have the computer identify what’s out there. Many animals make distinctive, repetitive calls of the sort that should be recognizable by fairly simple audio analysis. The cricket, cicada, and frogs, to name a few. So put a microphone outside, pipe the data in by cord, or wireless internet, and record and analyze it. Run it first through Fourier analysis and then identify duration/frequency patterns. Calls with a certain pitch lasting for a certain interval. Some calls are more complex, a chord, a pattern of notes, etc. Calls range from simple insect calls to complex bird calls. Then run repetitive patterns found through a species identification algorithm. The output would indicate what animals were detected and at what times, and perhaps record audio samples of each type. This sort of data collected routinely each night would give a dynamic picture of the fauna of an area. Crickets at night, birds at daybreak. If many people used this software and sent data to a central collection point, it could be used to monitor animal range and abundance, and perhaps indicate aspects of regional and year to year variation by detecting what species appear and when each emerges after winter. Some work has already been done on the software end of this. Here are papers on bird calls, bird calls, and insect recognition. Here’s a site with a good Postscript library for drawing variable width lines. I used two of these curves to draw a stylized pear. Sources of free to use / copyleft animal photos online. http://www.flickr.com/search/advanced/? Set the creative commons checkbox. Notes while reading The China Study by T. Colin Campbell, Ph.D. and Thomas M. Campbell II (2006). Does a book need both a gushing Preface and a gushing Forward? cans.” –True by definition, funny. â€¢ Dietary change can enable diabetic patients to go off their medication. â€¢ Heart disease can be reversed with diet alone. â€¢ Breast cancer is related to levels of female hormones in the blood, which are determined by the food we eat. â€¢ Consuming dairy foods can increase the risk of prostate cancer. â€¢ Antioxidants, found in fruits and vegetables, are linked to better mental performance in old age. â€¢ Kidney stones can be prevented by a healthy diet. â€¢ Type 1 diabetes, one of the most devastating diseases that can befall a child, is convincingly linked to infant feeding practices. Based in what I’ve read before, there’s good evidence for claim 1 for many patients, and claim 2 may be true. I haven’t heard claims 3, 4, 5, 6, or 7 before. ” …the War on Cancer, launched in the 1970s, has been a miserable failure.” –Cancer hasn’t been cured/prevented, but for many cancers the treatments are much better. There’s been a lot of progress. week.” –I’m not happy calling this a failure. Living with treatment is better than dying, and many people are on drugs to slow the progression of disease, e.g. diabetes and cholesterol drugs. Not an ideal situation, not complete cures, but still a good thing, not itself a sign of poor health in the population. “One third of the young people in this country are overweight or at risk of becoming overweight.” –Certainly a huge and worsening problem. Cool, the older Campbell worked with Clive McCay, the guy who discovered caloric restriction extends lifespan! p6. “In fact, dietary protein proved to be so powerful in its effect that we could turn on and turn off cancer growth simply by changing the level consumed.” –It will be interesting to see what kind of evidence there is for this and how broadly applicable this result is, especially the casein results. p7. ” …this project eventually produced more than 8,000 statistically significant associations between various dietary factors and disease!” –I’ve never seen a study that collected enough parameters to do this many tests. How unusual. p12. “Vascular (arteries and heart) health is possible without life-threatening surgery and without potentially lethal drugs.” –To a certain extent, for some people, unless this book has big surprises. p13. “The rates at which we die from cancer are among the highest in the world, and it has been getting worse (Chart 1.1).” –OMG, Chart 1.1 is crappy. Drawn unintelligibly. And looking ahead, unreadable charts are the book’s style. Paging Dr. Tufte! On to the substance of the chart–what the authors need to make their point is cancer incidence and death rates by age. For example, if the heart disease treatments are leading to people living longer, cancer death rates will go up for innocuous reasons. A different and better chart is required to show what the authors want to show. United States.” –Wow, the Campbells are promising a way of cutting cancer incidence by 50%. Got to read this! prevented and even reversed by a healthy diet.9, 10″ The refs here are to Dean Ornish et. al., 1990 and Esselstyn et. al, 1995. Ornish’s paper showed a 20% improvement in 80% of the 28 people with heart disease in the study. Esselstyn’s paper showed that a very low fat diet combined with drugs kept heart disease from progressing in the 11 people (out of 22) who stayed on the diet. Esselstyn’s 12-year followup study paper on these patients reports that all (or all but 1?) of them have not had a heart attack or required surgery. Very good results, but also very small groups of patients studied. p15. ” …a recent article by Barbara Starfield, M,D., stating that physician error, medication error and adverse events from drugs or surgery kill 225,400 people per year (Chart 1.5).” –True, but misleading. These are very sick people, and while medical errors may speed their death, many were not going to live long in any case. Every game of Tetris ends with a mistake. People sick enough to need hospital care face many risks, medical errors are just the most ironic risk. p17. “If nutrition were better understood, and prevention and natural treatments were more accepted in the medical community, we would not be pouring so many toxic, potentially lethal drugs into our bodies at the last stage of disease.” –This is an odd statement. Disease delayed, fewer drugs over the course of a lifetime, but very sick people would still be treated aggressively. p17. “What is all the extra financing buying? Is it creating health” –I think the Campbells conflate overall spending with the quality of the medical care. Yes, the figures they cite do show that the US spends way too much for the health care it receives, but this doesn’t mean the care is the problem. And on measures of overall, population health care outcomes the US score poorly, but that’s because many people in the US don’t get health care until an ambulance drops them at the hospital door and then they get booted out when they can walk, in a thumbnail. The authors are aiming to make the point that state-of-the-art US medicine is worse than the medicine practiced in other Western nations, and this line of evidence can’t really speak to it. p20. “Often, investigating minute biochemical parts of food and trying to reach broad conclusions about diet and health leads to contradictory results.” –Scientists often do very specific studies, but they don’t jump to making dietary recommendations from them. That’s BS. Crappy newspaper articles and crank diet books do this, it can’t be hung on the scientists. As a field, human nutrition is difficult; results are often weak, often contradictory, often only hold true for the particular group of people studied because the results depend on characteristics of the study population. It is also difficult to determine what to measure. What is health, what do you measure? How long does the study go on? Different measures can give different results. p24. “Those fed the low-animal protein diet exercised substantially more, with less fatigue, than those fed the type of diet that most of us eat.” –Interesting, though what is the outcome in humans? The authors don’t provide a reference. I hope that Chittenden’s small studies a century ago aren’t best data. p24. “Fewer people would need to wage lengthy, expensive battles with chronic disease in hospitals over their last years of life.” –Best case, people still will get old and die of *something*. p32. “During the 1960s and 1970s, I was to hear over and over again about a so-called “protein gap” in the developing world.4″ –Malnutrition used to be very common in Western countries and still is in many world regions. The historic common form of chronic malnutrition is protein-poor diets–people living mainly on grain and starches, and often barely enough of that. The problem was and is real. p32. “The u.s. government was subsidizing the production of dried milk powder to provide high-quality protein for the world’s poor.” –A truly terrible program with well-documented destructive results. I guess that what comes from a program that starts with a need to dispose of price-supported surplus milk. p33. “He went on to say that the” … supply of adequate quantities of animal products is generally recognized as being an ideal way to improve world protein nutrition.”” –With the traditional Western diet including a lot of animal protein, I think the default thinking was to help by adding the ‘missing’ animal products to the diets malnourished people. p37. “At that time, a research paper from India surfaced in an obscure medical journal.13 It was an experiment involving liver cancer and protein consumption in two groups of laboratory rats.” –In 1968 when this paper came out, cancer was very poorly understood. It wasn’t understood what caused it or how it developed. Aflatoxin and other mutagens were used as tools to investigate cancer. What made them useful is that they were simple chemicals that would produce very high rates of specific cancers. p39-41. “CORRELATION VERSUS CAUSATION. STATISTICAL SIGNIFICANCE. MECHANISMS OF ACTION. METANALYSIS.” –Here the authors describe various types of proof. With human studies, I like to see studies finding a correlation with statistical significance. I want to see several groups test the same hypothesis studying different groups of people. This provides evidence for causation, that the theory is true and that some weird aspect of the original study that the authors didn’t think of doesn’t account for the result. Results must have a plausible mechanism of action, and ideally the steps in the mechanism have been determined in detail. I find metanalysis typically worthless–it can be done well but often isn’t, so I prefer to read the studies and combine their results using my own judgment. p50. “But just like seeds in the soil, the initial cancer cells will not grow and multiply unless the right conditions are met.” –This model for cancer is simplified, but as I understand it this is a simplified model of afflatoxin-promoted cancer. There are other models, other paths that lead to cancer. Also, diet can affect initiation as well as the other phases, and mutagens, both ingested chemicals and those produced in the body’s cells, can speed the the other phases of cancer development. Also, the terminology here is a bit old fashioned–I would call promotion the precancerous and benign/primary tumor stage, and progression is usually split up into malignant and then metastasizing stages. There are more detailed clinical descriptions of cancer stages, and they are specific to each type of cancer. Also, different cancers have different natures–some rarely jump from benign to worse stages, others quickly and relentlessly worsen. It’s hard to talk briefly about cancer, especially in book for a general audience, the authors are doing fine here. p50. “At the start of our research, the stages of cancer formation were known only in vague outline.” –It’s really remarkable how ignorant we were about cancer in 1970. When Nixon declared War on Cancer, we didn’t even know how much there was to learn–how hard a nut cancer was. p51. ” …the mixed function oxidase (MFa).” –This is complex of enzymes commonly known as the P450s. p53. “From our extensive research, one idea seemed to be clear: lower protein intake dramatically decreased tumor initiation.” –By itself, this seems like the least interesting part of the story. It is specific to aflatoxin. A different mutagen could cause more mutations on a low protein diet. The effects described next, on cancer progression seem more general–more likely apply to different cancer causes. p54. “By watching foci develop and measuring how many there are and how big they become,32 we could learn indirectly how tumors also develop and what effect protein might have.” The 70’s and early 80’s were the heyday of culture studies. It was the hot new tech burning up biology. p58. “The most significant finding of this experiment was this: foci developed only when the animals met or exceeded the amount of dietary protein (12%) needed to satisfy their body growth rate.39″ –OK, so this gives an idea what this level of protein means for the animal. Another complicating factor is that the Campbell’s experiments were done on immature, still growing rats. p58. “This is considerably more than the actual amount required. But because requirements may vary from individual to individual, 10% dietary protein is recommended to insure adequate intake for virtually all people.” –Campbell is headed toward a low protein diet recommendation, and this is going to make a low protein recommendation for humans tricky. A protein level low enough to be effective but high enough to have few side effects is desired, but how wide is this window, and how much does it vary from person to person? p59. “CHART 3.7: AFLATOXIN DOSE-FOCI RESPONSE” –I understand the need to simplify in a pop science book, but what is the y-axis measuring? From the Campbell papers, it could be foci number or size, or a combined measure. p59. “Gluten, the protein of wheat, did not produce the same result as casein, even when fed at the same 20% level.” –Abstract here. The idea here is that the plant protein has a imbalance of amino acids ‘low quality protein’, and that the amount of protein usable by the body is lower than the amount ingested. p61. “This was a virtual 100 to 0 score, something almost never seen in research and almost identical to the original research in India.16″ –This is encouraging. The results hold for full cancer development and in adult animals. p63. “The adjoining graph (Chart 3.1147) shows the expression (activity) of two HBV genes that cause cancer inserted in the mouse liver. Both the picture and the graph show the same thing: the 22% casein diet turned on expression of the viral gene to cause cancer, whereas the 6% casein diet showed almost no such activity. ” –Just like for aflatoxin, dietary protein has an effect on both initiation and progression. Here initiation occurs through a different mechanism. p64. “This research showed that increasing intakes of casein promoted the development of mammary (breast) cancer” –Results hold for a second type of cancer when two different mutagens are used. Encouraging. p66. “The idea that nutrients primarily affect tumor development during promotion was beginning to appear to be a general property of nutrition and cancer relationships.” –Interesting. p66. “Furthermore, a pattern was beginning to emerge: nutrients from animal-based foods increased tumor development while nutrients from plant-based foods decreased tumor development.” –The evidence presented by the authors doesn’t support such a broad generalization. Past the dietary protein results, the evidence gets messy. There are studies showing some plant nutrients decrease cancer, some increase cancer, most have little or no effect. Campbell’s own study earlier on the page is an example of this. Chapter 4 The core of the book! p74. “For example, blood cholesterol ranged-as county averages-from highest to lowest almost twofold, blood beta-carotene about ninefold, blood lipids about threefold, fat intake about sixfold and fiber intake about fivefold.” –I haven’t a copy of the study book, Diet, Life-style and Mortality in China (1990), but I expect that one thing fuzzing the Chinese data is that people were sampled once, and so seasonal dietary changes will look like absolute differences. p77. ” Because these diseases of affluence are so tightly linked to eating habits, diseases of affluence might be better named “diseases of nutritional extravagance.” –Activity levels are also different and known to be a factor as well. p79. “I learned from three very prominent heart disease researchers and physicians, Drs. Bill Castelli, Bill Roberts and Caldwell Esselstyn, Jr., that in their long careers they had never seen a heart disease fatality among their patients who had blood cholesterol levels below 150 mgldL.” –Interesting, and there’s certainly a lot of data for a correlation between blood cholesterol and heart disease, but this is statement is anecdotal. p81. ” In more recent decades, some might also mention the cholesterol-lowering effect of soy or high-fiber bran products, but few will say that animal protein has anything to do with blood cholesterol levels.” –Few docs will separate them out, but as animal protein is the primary dietary source there isn’t much need to. A diet designed to have very low cholesterol (lower than typical recommended diets today) is a diet less animal protein and lower total protein. p82. ” The details that underlie these questions, when considered in isolation, are very misleading. As you shall see, considering how networks of chemicals behave instead of isolated single chemicals is far more meaningful.” –This seems to me more a matter a practicalities than preference. There are too many nutritional factors to study all of them together as a network. Practically, we can only study 1) factors in isolation, and in this was many factors have been studied in depth, or 2) combinations , i.e. particular diets, but only a few of them. Both approaches have been productive. Neither has identified (one or more) optimum human diet that people are willing to eat. p85. ” … concluded that only 2-3% of all cancers could be attributed to genes.4″ –I can’t get hold of this 1981 study. It’s hard to guess what is meant by this–I can think of several different possibilities–or how well the figure has held up. Outdated, certainly. Kevin Drum has a quick post on online education, a topic all the hip bloggers pop off on frequently. The incidiary quote from Berkeley professor of Public Policy Michael O’Hare is, “the ego boost for the prof of having a roomful of students listening to him for ninety minutes twice a week is important”. This is offensive in a funny way because profs typically don’t thrill from lecturing undergrads. On a bit more of the serious side, a tech education future where live lectures are not necessary at all could be a future where colleges don’t have an explicit need for most humanities profs. Natural science profs make money for a college, and so are less at risk. This possible future is naturally a cause of concern. The broader question is how to do online, tech driven education. I don’t think an effective way of doing this exists today. Different experiments are being tried, in distance learning classes at traditional schools, at low quality for profit education mills, and in variations in experimental classes all over. It’s worth asking why traditional lecture classes work–how do they teach students as effectively as they do? There are lots of aspects of traditional classes that I think add in to making them successful. 1) Classes take several months. Learning spread out is more effective. 2) Lectures add to learning. They communicate information in audible/visual form, and this complements written info. Some students learn better from one of these channels. This is old hat. But the benefits of lectures go beyond this. A recording doesn’t capture all the benefits of the lecture. 3) Lectures are given at specific times, preventing procrastination, preventing cramming, and spreading out learning. Recorded lectures that a student can watch anytime lose these benefits. 4) Lectures are social events. 4a) Students meet each other in person. And can talk about the class, plan later study sessions, etc. The imposed social event of the lecture encourages these things. 4b) Watching a lecture with other students reinforces student attention and signals students that this an important event, not just a TV show. I would hypothesis that feeds into human instinct and human nature to help learning. 4c) The students have a social interaction with the prof, and even the weak social interaction of a large lecture has this benefit. People are more willing to learn from someone they know and pay more attention at a live event and to a prof lecturing than to a recording. 4d) A prof localizes the class. Connects it to current events, often local events. Speaks the language of the students, not completely of course, but to a degree. Explains concepts with reference to local or familiar examples. This aids not just communication, but is another way in which social interaction aids learning. I’m not a social scientist or education researcher, and I haven’t studied this, but based on my experience I think these factors are part of why in person education works. I think these elements are a good part of the reason why the format of the traditional class developed. In theory, college (or HS, or middle school) students could be given a textbook and a detailed syllabus and set of learning objectives. They would go learn, and show up for tests to demonstrate their learning. No traditional college does this, has this format. And no students, or effectively no students, do this. Students who can’t afford college don’t work through the textbooks and pop up fully educated, leaving colleges to awkwardly wrestle with the question of whether to grant a degree or require the student go through the empty formalism of paying and taking classes. For some reason students need classes and teachers and can’t learn without them. A tech-enabled, tech efficient class that uses only a fraction of the highly skilled labor done now by profs and TAs needs to replicate the human and social factors that are part of the current college course to be as effective. Can a solar panel be used to cool a beer cooler? The lid of a picnic cooler is big enough to hold a typical 20W solar panel ($60). How much energy does it take to keep a cooler cold? I couldn’t find specifications for cooler insulation. I guess picnicers don’t ask. Figures for styrofoam are available, figure 2 in. of styrofoam. Styrofoam has a thermal conductivity of 0.033 W/mÂ°C (or here). Let’s assume air temp of 90F, cooler temp of 40F, that gives a delta T of 28 Â°C. Heat flows in through the walls of the cooler. A cooler has an internal surface area of about a foot on each of six sides, 6 sq ft, about 0.67 m2. Plug the figures in, the cooler heats up at rate of 12 Watts an hour. So 12W of cooling should keep it cold. So the 20W solar panel powering a Peltier cooler with heat sinks inside and outside the cooler should be able to keep a picnic cooler cold during the day. The solar panel will provide less power when the sun isn’t overhead. The Peltier cooler is inefficient, figure 50% efficiency, effectively 10W of cooling when it gets 20W of solar power. Peltier coolers also have a peak temperature difference of about 20Â°C, so poor heat exchangers will cut its effectiveness. Extra heating by the having the cooler sitting in the sun, or not enough sunlight on the solar panel, or opening the cooler will decrease the system effectiveness. Perhaps it would only cool the contents to 50Â°F. This assumes that the cooler starts cold. This system does not have the power to cool down a room temperature cooler full of liquid. Figuring two and a half gallons of liquid (10 l) in the cooler, it would take nearly a day to cool it from 90Â°F down to 40Â°F running off a battery or wall current. The limits of Peltier cooling is a delta T of about 60Â°C, achieved by sandwiching several layers of coolers together. A small 4 in. square chamber surrounded by 3-4 inches of Styrofoam only needs one Watt of cooling. Sandwiched Peltier coolers are inefficient. At a guess, the same 20W solar panel would work. At night, the chamber would heat up at a rate of about 1Â°C an hour, reaching say -15Â°C at dawn. So small scientific samples could be frozen in a portable, off-grid cooler of this type. 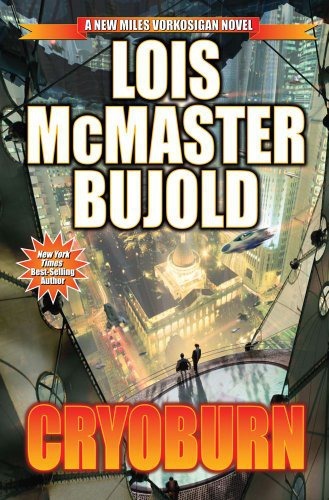 A new Miles Vorkosigan book by Lois McMaster Bujold is coming out in November. It’s called Cryoburn. It looks like a local story, not changing the larger arc of the series. The series is at an interesting point. Early on, it was heading toward having Miles by the key player in the Barrayar/Cetaganda war that seems to be developing. Then the series changed direction. There was a small Barrayar/Cetaganda border skirmish in The Vor Game. Then in Cetaganda, Bujold gave indications that the Cetagandan empire wouldn’t be aggressively expanding. When Miles got permanently discharged from the military that seemed to be the end of the war plot direction. So what’s next? Bujold could stop writing this series. But I’m a fan, and like a vampire want more, always more from the author. So I see one main possibility–aliens! Perhaps the Cetagandans run into hostile BEMs in the far reaches of the empire and the reaction wave runs into Barrayar space. Cetagandan fleets retreating through through the other planet’s wormholes stir things up, or the plot that develops slower, the Cetagandans reaching out for help. Or the Barrayarans or Miles encounters the aliens himself. The Vorkosigan books are set in a human universe, so any alien plot would also have first contact overtones.